Welcome to the portal for Erwin Blumenfeld, regarded as one of the most influential photographers of the twentieth century. An experimenter and innovator, he produced an extensive body of work throughout his thirty-five year career including black and white portraits and nudes, celebrity portraiture, advertising campaigns and his renowned fashion photography. This site has been created by the grandchildren of Erwin Blumenfeld as a one-stop resource for anyone interested in his work. Please contact us if you have questions about any of the images or information presented here, or if you have information or images of your own that you’d like us to upload. If you have requests to publish, reproduce or distribute any of his images, please just ask.When Erwin Blumenfeld died in 1969 he left the disposal rights of his photographic archive to his assistant, Marina Schinz. At the time there was little interest in vintage prints and Marina chose to divide the prints into four parts, one for each of the three children and one for herself. 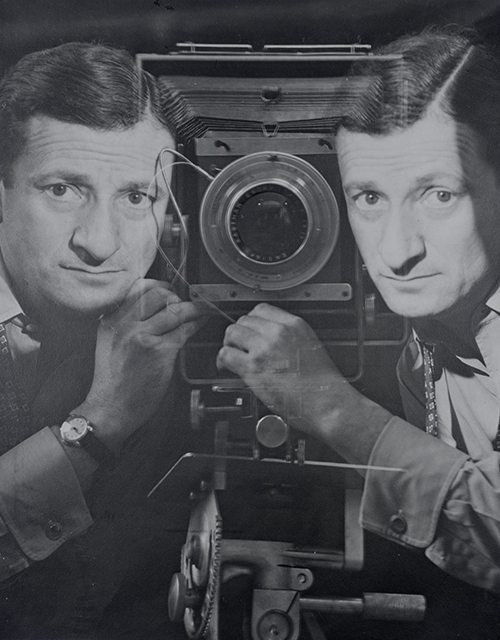 Having four disparate stakeholders in Erwin Blumenfeld’s legacy has caused a lot of confusion amongst curators, galleries, museums, collectors, editors and publishers. There has not been one guide to the Erwin Blumenfeld story, until now. In order for your request to be processed, kindly fill in the form below so that we may carefully evaluate your proposed use. As part of the protocol, licensees of Blumenfeld images are expected to observe the following guidelines: the licensed image must be shown in its entirety without cropping or overlay of type; the Blumenfeld Estate must be given the opportunity to review and approve the final design layout (including facing pages), credit lines, and any accompanying text for accuracy at least one week in advance of publication or public release; and copies of the item(s) in which an image is licensed must be provided to the Blumenfeld Estate for its archival repository upon request. These guidelines are binding legal requirements for images licensed by the Blumenfeld Estate, and in cases where an invoice is issued, no grant of reproduction rights is effective until payment of the required licensing fee is made in full and received.